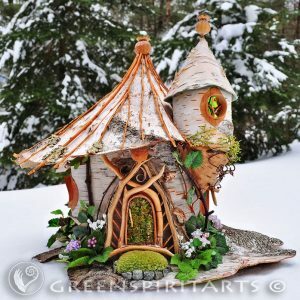 This lighted house features a removable needle-felted roof, fully finished interior, a working door and fanciful balcony from which the flying faeries can come and go. This sweet house was pure joy to make. It has all the desirable features one wants in a cozy cottage, especially when the sun goes down in the garden and the twilight deepens, then the magical lighting brings an even deeper sense of enchantment. The house is fully finished inside so when the felted roof is removed, a cleanly finished and lightly decorated space is contained within. With room enough for you to add some tiny furniture of your own, or perhaps some special trinkets for a special daughter or grand-daughter, this house is the perfect size to sit on a bed-stand, mantle or book-shelf. Approx 12 x 10 x 13 high. The house can be removed from the base and can stand on a smaller footprint if needed.